Last week William & Mary closed up shop and students were sent packing due to the threat from Hurricane Florence. This semester I’m teaching Weather, Climate, & Change (GEOL 100) and the Earth’s Environmental Systems (GEOL 110), in both courses we discuss hurricanes (typically at mid-semester). For obvious reasons, Hurricane Week 2018 came early. On Monday, September 10th we discussed the conditions needed to charge up a tropical cyclone, control its track, and then considered the forecast for Hurricane Florence in the coming days. On Tuesday, September 11th at 10:52 a.m. I experienced the rarest of phenomena – squeals of joy from students assembled in a Geology department hallway. The notice had just been sent that William & Mary would cancel classes after 12:30 p.m. and campus was to be evacuated by Wednesday at 5 p.m. Classes were canceled for at least the next three days and students were ecstatic. I’ve been a W&M professor since 1996, and have experienced nearly a dozen tropical weather systems that impacted the university. These late summer to fall storms serve as intellectual grist for my courses focused on weather, climate, and the environment. 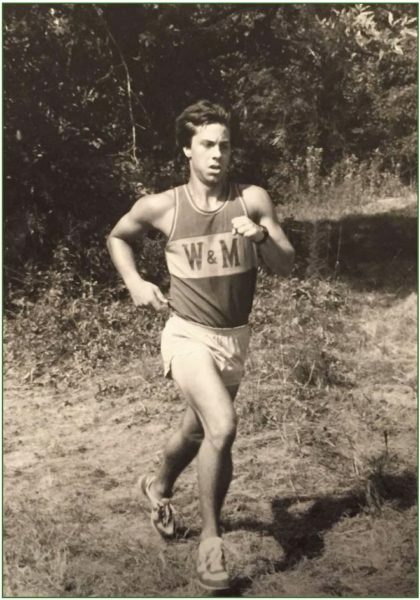 Me, as a fair to middling athlete, in the Fall of 1985 during my first semester at William & Mary. Photo by Randy Hawthorne. However, my first experience with a hurricane at William & Mary came way back in September 1985. 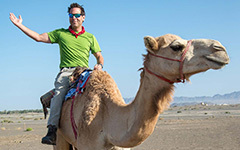 I was in the midst of my first month at college, and devoted to my studies and athletics, so little did I know that 3,000 km (2,000 mi.) to the southeast of William & Mary a hurricane was churning across the Atlantic. That storm was Hurricane Gloria, and by September 24th it had become a major hurricane rolling towards the East Coast. 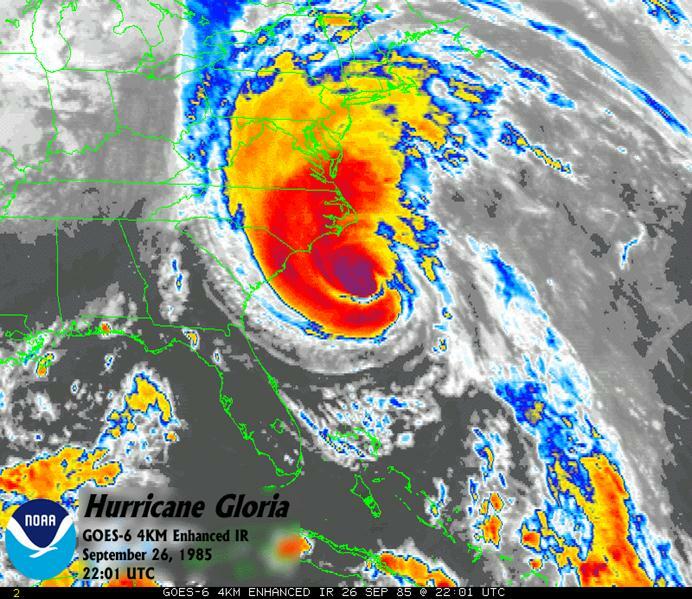 On Thursday, September 26th Gloria was moving crisply to the north-northwest and looked to make landfall in North Carolina. Based on its trajectory, it seemed that William & Mary would take a solid hit from Gloria. Enhanced satellite imagery of Hurricane Gloria approaching North Carolina’s Outer Banks, September 26, 1985. Image from NOAA. Classes were sensibly cancelled for the following day. Many students spread the apocryphal rumor that this was the first time since the Civil War that William & Mary had cancelled classes1. Campus was not evacuated, although we were encouraged to stay put and tape up dorm windows to brace the glass from the wind (in 2018 that’s not a recommended practice). What ensued during the evening of the 26th (and into the wee hours of the 27th) was a campus-wide hurricane party, revved up by Van Morrison’s Gloria played over-and-over on boom boxes. For some reason, I awoke late and a tad groggy on Friday, only to be greeted by a glorious blue sky and a refreshing breeze from the northwest. Where was Gloria? The William & Mary campus sustained no major damage and the power was still on. Since classes and cross country practice were cancelled I played golf with my dormitory buddies. It was a great day. This was my first Hurrication (a holiday created by closings and/or evacuations associated with preparations for and the arrival of a hurricane). Hurricane Gloria briefly made landfall at Cape Hatteras, as it gradually turned from a north-northwesterly course to a north-northeasterly track. Williamsburg escaped a direct hit from Gloria, however there was plenty of rain and the winds briefly reached tropical-storm-force (60 km/hour or 39 mph). In Virginia Beach, gusts reached hurricane strength. Make no mistake, Gloria was a powerful and destructive storm, it wrought damage all along the Mid-Atlantic coast and later plowed into Long Island and New England creating mayhem in its wake. Gloria’s near miss of Williamsburg and its turn towards the northeast was considered by many of my 18-year old cronies as a sign of divine intervention or good luck. It was neither. Gloria’s track was similar to many Atlantic hurricanes that reach the middle latitudes, here as hurricanes move further north they typically experience stronger and stronger westerly winds that eventually turn these storms back towards the Atlantic. More than three decades on, I continue to use Gloria as an example of a classic Atlantic storm. Hurricane tracks for Gloria (1985) and Florence (2018). Concentric markers illustrate the center of the storm at 12-hour intervals. Two weeks ago, Hurricane Florence was spawned under similar conditions to Hurricane Gloria thirty-three years earlier. When the storm was still 2,000 km (1,600 mi.) from the coast, the National Hurricane Center forecast-track predicted Florence coming ashore in southern North Carolina. Six days later, that’s just what happened – the power of science, it can be harnessed to make reasoned and testable predictions about the future. By Monday, Florence had slurped up enough heat from a patch of abnormally warm Atlantic waters to rapidly intensify into a major storm with sustained winds exceeding 175 km per hour (110 mph). On Tuesday, based on the available storm information at that time, William & Mary’s Emergency Management Team cancelled classes and decided to evacuate campus on Wednesday. That decision might have been informed by the 8 a.m. (EDT) Intermediate Advisory 48A from the National Hurricane Center. That advisory placed southeastern Virginia well to the north of the centerline track for Hurricane Florence, but near the northern edge of the possible 4- to 5-day track cone. For Williamsburg, the prospect of tropical-storm-force winds were placed at 50% (a one in two chance). National Hurricane Center forecast advisories for Hurricane Florence (Sept. 11-12, 2018). Note the westward shift in the projected track of the hurricane from Sept 11 to 12. Click on the image to enlarge. With that decision, classes abruptly ceased mid-day on Tuesday and students made plans to leave. By 8 p.m. on Tuesday, Advisory 50A had Florence turning to the west once it made landfall in southern North Carolina, Williamsburg now lay outside the warning cone. 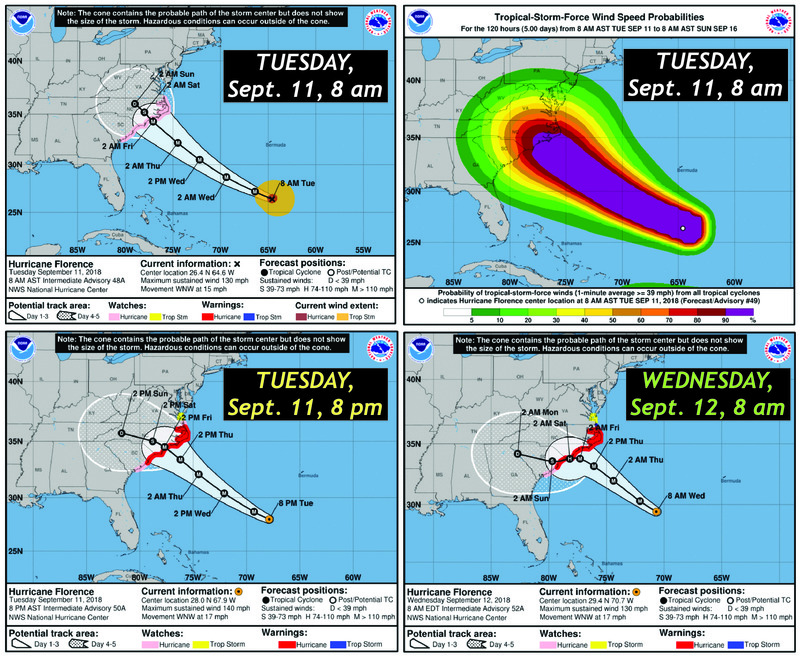 That forecast trend continued – Wednesday morning’s Advisory 52A put Florence’s onshore track even further to the south with a 30% probability of tropical-storm-force winds in Williamsburg (less than a one in three chance). Wednesday was a curious day at William & Mary as campus became progressively deserted, while Florence’s threat to Williamsburg quietly diminished. Thursday and Friday were the 2018 version of a Hurrication. For the next few days Williamsburg’s weather was overcast with a steady easterly wind and a spot of rain. Nothing too bad, the power never even flickered. When classes resumed (Monday, September 17th) I asked my students to interpret the wind data recorded at the Coast Guard’s pier in Yorktown (my favorite weather station). What was the sustained wind speed during the storm? From what direction did the wind blow? Even at Yorktown, facing the waters of the Chesapeake Bay, tropical-storm-force winds were never observed during the past week2. Some 350 kilometers (~230 miles) south of Williamsburg, Hurricane Florence came onshore and ravaged the Carolinas. It was a powerful storm that slowed to a crawl and dumped feet of rain. The combination of a slowed hurricane and the low coastal Carolina topography led to massive flooding and, with it, tremendous suffering. Given our warming climate and a rising sea-level we should rightly worry whether this is the new normal for tropical cyclones in this corner of the world. This is another timely topic that we discuss in my courses. Did William & Mary make the right call to cancel classes and evacuate campus? It seems the intention of those statements is to cut off any discussion, critical or otherwise, of what transpired. I maintain we should engage and reflect upon university decisions – both what went right and wrong. As for emergency decision making at William & Mary, I’ve no inside information — that’s well above my pay grade. I do teach meteorology and climate science, but have never been asked to weigh in on these decisions. Science should inform policy, but let’s face it – that happens with less frequency than you’d think. I think decisions were locked in place too early. Williamsburg never had more than a 50% chance of experiencing tropical-storm-force winds. Perhaps these decisions were all driven by concerns about student safety, but William & Mary and its on-campus students have weathered tropical-storm-force winds before. Another hypothesis is the university is trying to minimize its risk (not necessarily students’ risk). The evacuation effectively transferred responsibility from the institution to students and their families, for many that was an unnecessary burden. The loss of +3 instructional days has created its own set of difficulties, which are made more acute by William & Mary’s short academic year (compared to other Virginia universities)3. No doubt William & Mary, working in conjunction, with the State government had certain constraints placed on what the university could do or could not do in the run-up to Florence. 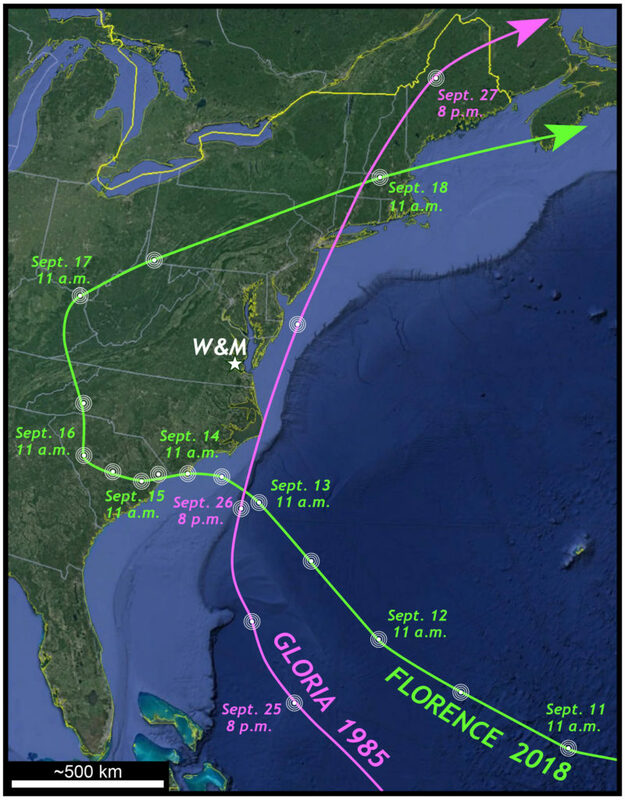 But it’s interesting to consider that William & Mary’s response to similar storms (Gloria vs. Florence), separated by three decades, was quite different. For the past five years, students in my Weather, Climate, & Change course completed a group project on the meteorology and significance of a past tropical cyclone. In previous years, they chose major storms that were so impactful and disastrous that their names were retired. I was inspired by Hurrication 2018, to retool the assignment such that groups will research a past Atlantic hurricane which had an impact on William & Mary. We’ve picked 11 hurricanes that occurred between the 1950s and 2018 to research, some of these storms were a big deal (Isabel), and some looked to make trouble in Williamsburg but were ultimately a bust. The end goal is to craft a multi-media History of Hurricanes at William & Mary that will serve as the reference on William & Mary’s hurricane history for all time coming4. 1- Between 1950 and 2003 William & Mary cancelled classes 11 times, an average rate of once every five years. Students in the mid-1980s had no personal memory of past closings. In the 15 years since 2003, William & Mary’s cancelled classes on at least 10 separate occasions. Have extreme weather events (hurricanes, tornadoes, and snow storms) increased that dramatically? 2- The windiest day of the past week (Sept.10- 17) in Williamsburg occurred on Monday, Sept. 17th – the day the university reopened classes. 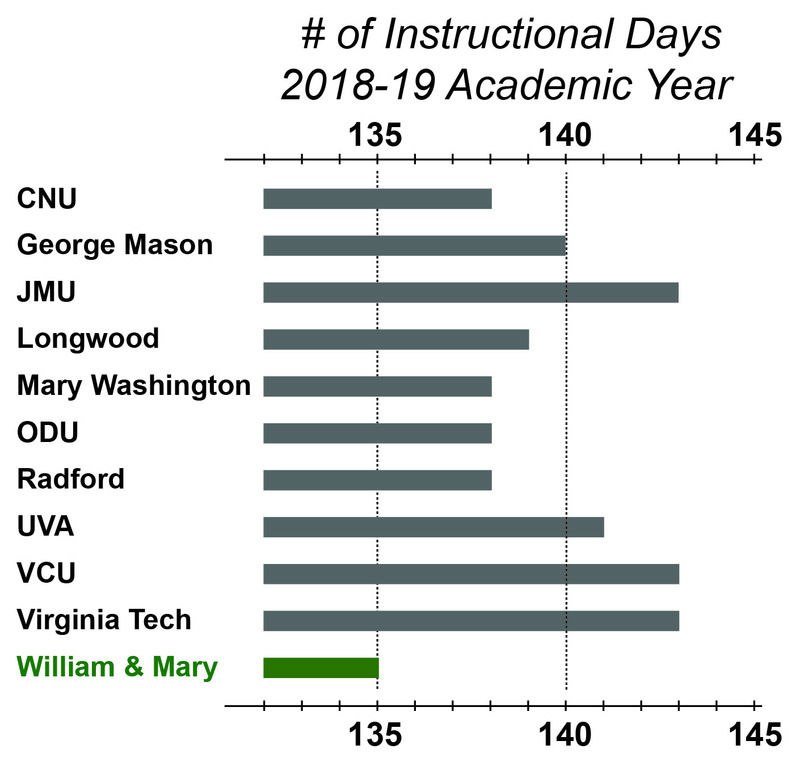 3- Graph of instructional days in the 2018-19 academic year for some state-supported institutions in Virginia. William & Mary had 135 instructional days scheduled before the cancellations due to Hurricane Florence. 4- all time coming, it’s a line in William & Mary’s Royal Charter – go check it out! You should do an article on Hurricane Bonnie. Love to visit your college!